It's Easter week (one of my favorites) and April is flying by. Another fairly blown week last week. It's what happens when I don't make it shopping on Sunday or Monday. Lets try again this week. I'm thinking that the Lemony Spring Risotto I'll be making with Orzo instead of rice... but keep the recipe similar. Hope everyone has a great Easter! 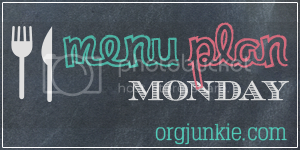 More menu plans at org junkie.